Please stop asking this. Plus FUNKe did nothing different but change the font from Broselhud. If you want me to update for you, well fine I'll do it just please stop asking. Aubriac I have no idea what the name is of this hud, but it hasn't been updated for a while. I guess I'll call it Garm3n Biester since he's the one who uploaded this. Looks like I have problems with one of the fonts, if I manage to fix that I'll update it. CardfightGamer BUBBLES6721Please update funke hud Please stop asking this. Plus FUNKe did nothing different but change the font from Broselhud. If you want me to update for you, well fine I'll do it just please stop asking. Hypnotize SkinnyMind Update Indust hud pls marq I updated it sort of using the most recent version of rayshud https://puu.sh/s01AP/e6c52c4060.zip Just above you! Aubriac I have no idea what the name is of this hud, but it hasn't been updated for a while. I guess I'll call it Garm3n Biester since he's the one who uploaded this. Looks like I have problems with one of the fonts, if I manage to fix that I'll update it. HashtagBased Hypnotize SkinnyMind Update Indust hud pls marq I updated it sort of using the most recent version of rayshud https://puu.sh/s01AP/e6c52c4060.zip Just above you! If all I did was change the font and colors then I would have updated it for him a long time ago. The way you talk me down like I did nothing to it is insulting and rude. He never even specified which version he wants updated (which makes no sense). I've got versions of the hud that are nearly from scratch, but i've got others that are indeed only slight variations of others. If he messaged me what version he wanted I'd at least be willing to try and fix it but he chooses to clog the thread instead. I wasn't trying to insult or to be rude to you or anything. I really didn't know all of the elements you've changed. I'm Sorry if it sounded like I was being rude. leave that job to me... no wait, maybe if you are patient enough to wait for a couple of years. Any chance you could do Garm3n 4MP? How can you remove the highlighted numbers in basthud? about rhb hud, the killfeed seems to be not fully visible. does that have to do with 16:10 ratio? ohmy_dHow can you remove the highlighted numbers in basthud? What do you mean for "highlighted numbers"? imectusabout rhb hud, the killfeed seems to be not fully visible. does that have to do with 16:10 ratio? Yeah probably, well you can easily try to fix it... just open the hudlayout.res inside the scripts folder then search for huddeathnotice and adjust the "xpos". Right now is 222 try to lower it a bit. um i mean the numbers turn red when you're low health like the m0rehud theme. ohmy_dum i mean the numbers turn red when you're low health like the m0rehud theme. Oh ok, well if you want to remove everything (like the animations when you are low/buffed/lowammo or even the full uber) you can just delete the hudanimations_custom file i guess. While if you want to delete only the low health animation for example, go always to hudanimations_custom and delete the whole "Health Dying Pulse" section. can you make a .zip file with all the huds you've updated just so that i don't have to download every hud one by one? smesican you make a .zip file with all the huds you've updated just so that i don't have to download every hud one by one? [quote=smesi]can you make a .zip file with all the huds you've updated just so that i don't have to download every hud one by one? Hey, can you update notoHUD please? This HUD is great but it's really outdated. 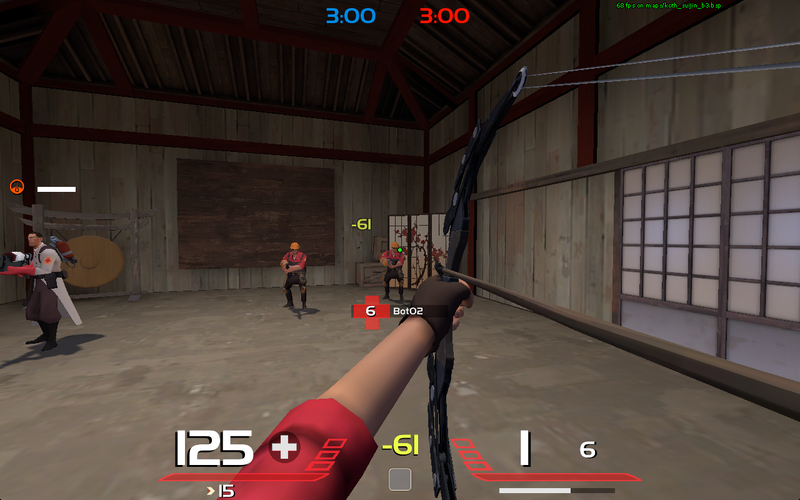 in oxide hud can you remove that health cross next to that numeric health cross? imectusin oxide hud can you remove that health cross next to that numeric health cross? Change the "visible" and "enabled" fields from "1" to "0"
Change the "xpos" or "ypos" fields from what their value is to a very large number, 9999 for example. This forces the hud element to render offscreen, "removing" it from what you see onscreen. If you're doing it while tf2 is running, after you've saved the file, type hud_reloadscheme into your console, and you should see a change. [*] Change the "visible" and "enabled" fields from "1" to "0"
[*] Change the "xpos" or "ypos" fields from what their value is to a very large number, 9999 for example. This forces the hud element to render offscreen, "removing" it from what you see onscreen. Can you update this hud please? Could you possibly update 4x3 scoreboard for OMPHud? help,when i try to activate fog's crosshair in basthud and hud iscariote it doesn't show.